Last month we were able to achieve a good profit with sports betting. The DiversiTips strategy is again proven (especially the ST#2 tip series). Not only are they doing well in the game but also with the full DFC membership as everyone benefits from the profits in some way. Our strategy is simple: we are playing high scores and playing with the right bet management. Our bet management is also simple: for a losing bet, raise the next day's bet to compensate for the loss of the previous day and gain. Some people say: not much of the 5% profit per week! Okay! If you want to increase your earnings then play with us at DiversiTips. We are there and we are waiting for you! That's it! I reached the top of the DP25 packs for the first time. 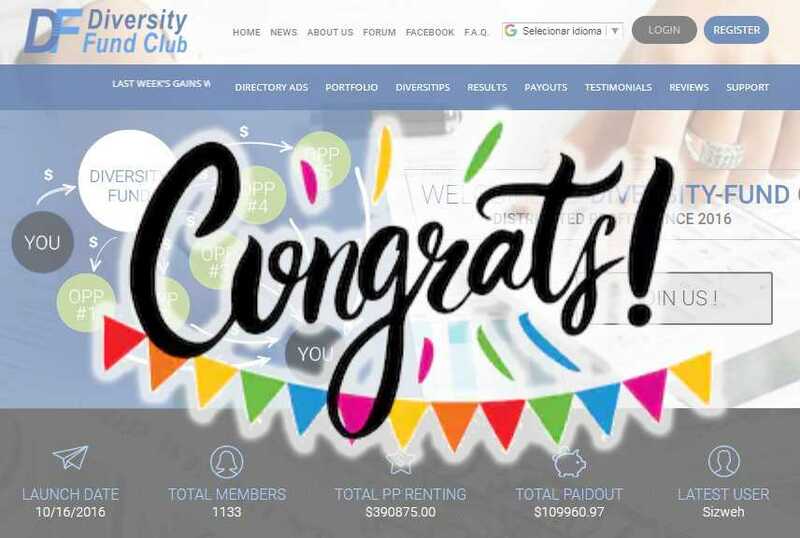 This sum of packages is equivalent to more than $ 500 spent on purchases with deposits from outside or with reinvestment form my balance which in the meantime accumulated with packs return and with the commissions I received with referrals. Diversity Fund is now two years old! Congratulations to the admin for being able to handle the boat so well, and us because we are helping the site to grow while making money passively! The celebrations of the second anniversary of Diversity Fund are already there but the party motives will be kept because the admin has just launched the 3rd contest of the site that has been called "AA" (Attract / Activate). With this contest the admin will reward the 100 members who can attract more purchases of Profit Packs from members of their list of referrals (new or inactive), between the days October 22 and November 30. - 5th to 100th place: 1% of the amount deposited by the aforementioned. To increase your chances of winning a prize, I have decided that I am going to share 50% of the value of my prize with my referrals ... if I can gain a prize off course! For this I will write down the purchases of each referral and in the end I will distribute 50% of what I will win for the 3 referrals that made the most deposits since registering on the site through my link. I hope this idea interests you, if you have any questions or suggestions, talk to me. Another rounded number reached !! I got the second payment from Diversity! Now I will reinvest the earnings to try to buy the second DP50 package. Recall my contest that is still in place, in which I will share 50% of my earnings with 3 active referrals. Have you noticed the Diversity Fund's reputation on CoinPayments? Already has 465 positive mentions, 2 are neutral (without explaining why), and 1 is negative because the person who gave this evaluation complained that he did not receive soon the packages bought ... but the site itself informs in TOS that this process is not instant! With such a high reputation in so many places, do you still wonder if the site is working so well ?! Back to shopping, I bought the 24th package, again with 20/20 DP25 packages going forward to my second DP50! One week left to finish the competition of this site where 100 members will be given prizes. At the same time I will also finish my contest that will reward the 3 referrals that have bought the most packages since registering. Today the maturation period of one of the first DP25 packages I bought when I registered on the site has ended, it means that I paid $ 25 and have already received back the $ 25 plus $ 5 profit. As I had balance I repayed another and there is still money left over that will accumulate until I buy the 3rd DP50 package. Three days left to finish the contest of the site and for now I am in 17th place in the provisional classification. I remember that I will give 50% of my prize to the 3 referrals that invested the most on the site! The contest of the site ended and there is a final classification list. 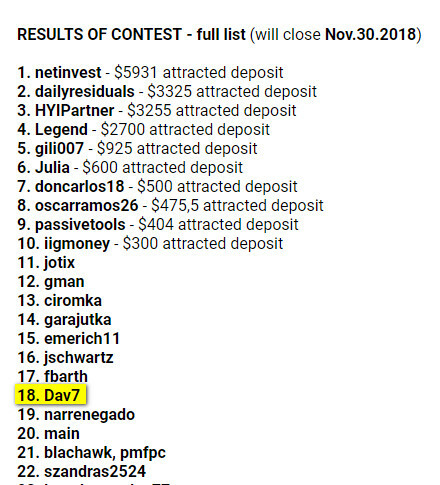 I was in 14th place which means that I received the 1% prize that, for the accumulated purchases of my referrals, is equivalent to $ 3.21. I remember that I had said that I would distribute 50% of my prize for the 3 referrals with more package purchases, but that was a very low value ... so I will give $ 5 to the best referral and $ 3 to the remaining two. And today I bought the 3rd DP50 package! Please contact me privately to proceed with payment. 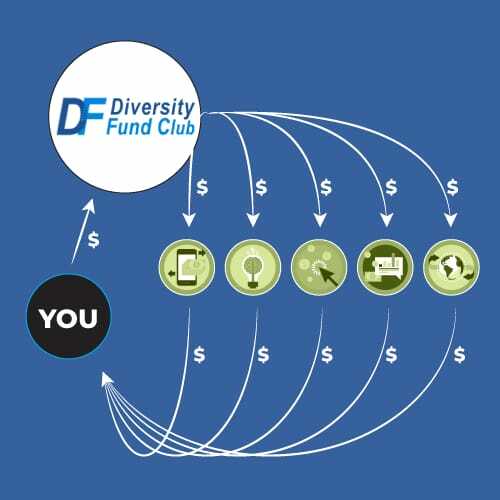 I hope 2019 continues to be great for the Diversity Fund, I will be here to continue rewarding my referrals! I received the 3rd payment! My first DP50 package matures this week, though I bought one more today and I hope to soon reach 5 DP50 packages!